Samsung just lost the crown of the top smartphone seller in India for the first in 6 years to the Chinese company Xiaomi. The 4th quarter of 2017-18 saw the Chinese manufacturer outsell Samsung by around 900,000 units. Samsung has been displaced by Xiaomi from the top of the Indian smartphone market, as per a January 24, 2018 report by independent tech analyst Canalys. Having gradually depleted Samsung’s lead over the past eight financial quarters or so, Xiaomi now holds 27% of the market while Samsung follows closely at 25%. The Chinese company sold nearly 8.2 million units in the final quarter of 2017-18, while the South-Korean giant managed to ship just over 7.3 million units. This, despite Samsung having registered a 17% growth this year. The company, which is exploring a public listing and is now valued at close to $100 billion (roughly Rs. 6.34 lakh crores), entered India just over three years ago. Samsung has fallen behind in its low-cost product portfolio in the sub-₹15,000 segment. At the same time, Xiaomi’s growth in India was thought to be boosted by its strategy of localising autonomy in its Indian operations with respect to marketing. 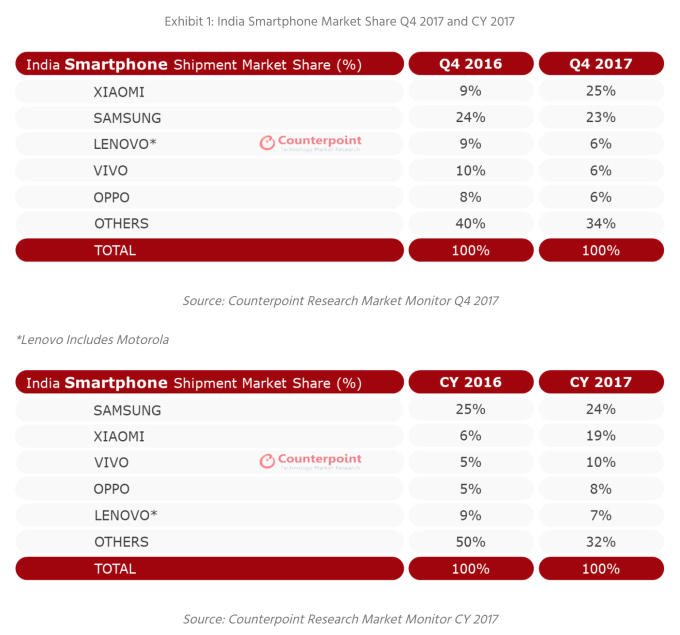 Canalys’s Rushabh Doshi explained that Samsung lost ground because Xiaomi was able to exploit its weakness in the sub-INR15,000 (US$240) market with its affordable Redmi series. Doshi pointed out, however, that Samsung’s “far superior” R&D and its supply chain expertise give it advantages that will help it compete fiercely with Xiaomi brand, which arguably better marketed in India.